Last September 10, 2011, NASA launched a Delta II rocket carrying two satellites to the moon. 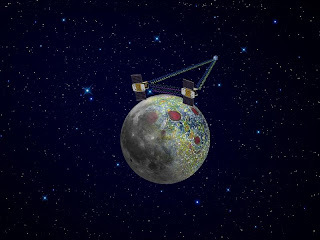 The objectives of the Gravity Recovery and Interior Laboratory (GRAIL) satellites are to map the lunar gravity and use that information to increase understanding of the Moon's interior and thermal history. The satellites have been inserted into the lunar orbit just hours ago. The insertion maneuvers placed each orbiter into a near-polar, elliptical orbit with an orbital period of around 11.5 hours. Over the course of the following weeks, the GRAIL team will execute a series of burns with each spacecraft to reduce their period down to just under two hours. By March 2012, the two GRAILs will be in a near-polar, near-circular orbit with an altitude of about 34 miles (55 kilometers) from the moon's surface. The two GRAIL spacecraft are almost identical to each other. Both are about the size of a washing machine, with minor differences resulting from the need for one specific spacecraft (GRAIL-A) to follow the other (GRAIL-B) as they circle the Moon. The science payload on each spacecraft is the Lunar Gravity Ranging System (LGRS). The LGRS measures the changes in the distance between the two GRAIL spacecraft down to a few microns. A micron is about the diameter of a red blood cell. Each spacecraft will also carry a set of cameras for MoonKAM, marking the first time a NASA planetary mission has carried instruments expressly for an education and public outreach project. Scientists will use the gravity field information from the two satellites to X-ray the moon from crust to core to reveal the moon's subsurface structures and, indirectly, its thermal history. Scientists are hoping to find out more about the Moon's inner core. The measurement technique that GRAIL will use was pioneered by the joint U.S.-German Earth observing Gravity Recovery and Climate Experiment, or GRACE, mission launched in 2002. The GRACE satellites measure gravity changes related to the movement of mass within Earth, such as the melting of ice at the poles and changes in ocean circulation. Once the orbit insertion is stable, the GRAIL satellites will be renamed from "GRAIL-A" and "GRAIL-B" to something more engaging. A public competition is being held to choose the names.